Installed in the back room of the Swiss Institute’s ground-floor galleries, like the children’s section in a bookstore, are some of Franz Gertsch’s earliest works, such as small drawings based on fairy tales of teapots come to life, Begegnung (Encounter), 1957, and a woodcut print of a man cursed to become a bear, Vor dem Spiegel (Tristan Bärman) (In Front of the Mirror [Tristan Bärman]), 1961. The artist returns to the subject of the mirror stage in his later photorealist paintings, based on photographs he projected onto canvas and painted in darkness. At Luciano’s House, 1973, depicts adolescents preening themselves, in the process of going out and growing up. 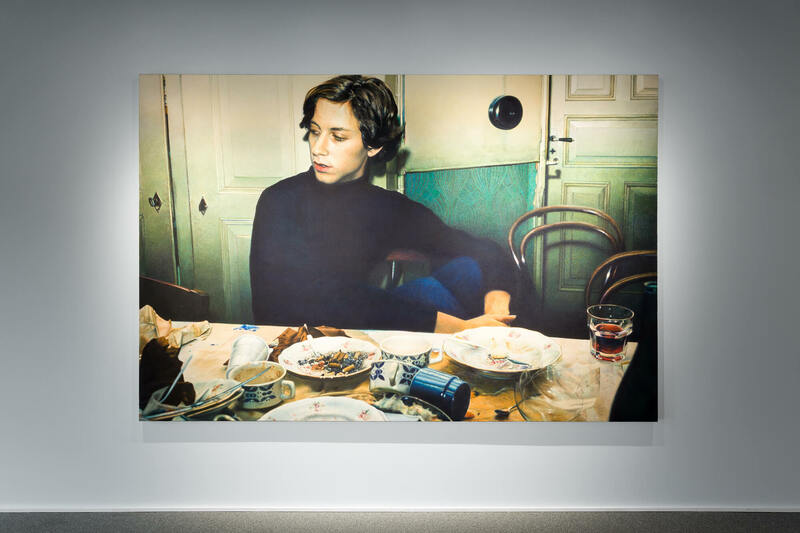 These works overpower in their scale and precision; one can almost smell the cigarette smoke staining the frayed wallpaper in Luciano I, 1976, a monumental picture of a boy sitting amid the remnants of a dinner party. But the hyper-detailed rendering also manages to turn the image into an abstraction of pure texture, and Luciano’s skin, awash in a moody celadon, calls to mind the slippage between porcelain and flesh. “Natascha,” 1988, a triple portrait comprised of three oversize woodcut prints, darkens in gradations, from hospital-gown green to sanitarium blue. The series is punctuated by a fourth woodcut, Schwarzwasser (Blackwater), 1991, where, in place of a face, we get the dimples and reflections of a dark body of water. Subject becomes object becomes vapor. As with Christian Schad’s Neue Sachlichkeit portraits of the 1920s, there is something intoxicating about the glacial potency of Gertsch’s human subjects, who live within a beautiful state of arrested development. An odd space that, like the world of fairy tales, is tinged with a touch of horror.